Julia Wilbur, on a boat from Georgetown to New York City, had seasickness and couldn't wait to land. Finally, relief. She spent a day and a night in New York City (as I did this past weekend) before going further north to visit family. Staten Island is very beautiful. Elegant residences on the heights. Stopped at Quarantine. Health officers & news boats came & then we heard that Lee had been routed from Pa. by Gen. Meade. Three cheers given. This is 7 or 8 mi. from N.Y.—passed Governor Isl. & then went up East River to foot of Wall St. Our gun was fired when we stopped. This was about 9 & it was nearly an hour before I cd. leave the boat. The Girard is now the Cosmopolitan in Tribeca. I dragged my family to see it. Although the hotel is justly proud of its history (as the 1880s illustration in the lobby indicates) and renovations were under way on the facade, the overall effect was a little less grand than I expected. Where was the grand lobby? The place to meet and greet? But I gamely told the desk clerk about Julia Wilbur spending the night there on July 7, 1863, and he gamely listened. According to the hotel website, the hotel was built in 1838, with an addition in 1852. "The Girard House as it was originally named became known as one of the city's finest of its kind....Rich in history (various sources claim Abraham Lincoln stayed her during his famous Cooper Union speech), the landmarked building is among the most historic lower Manhattan hotels." About 1 P.M. I was ready to walk. Went to office of A. S. Standard [Anti-Slavery Standard newspaper]. Saw Oliver Johnson & paid 3.50 per Standard. He showed no interest in my mission, made no inquiry till till I was leaving, then he asked if I knew H. Jacobs & said “he was much attached to her.” I answered him briefly & passed out rather quickly for I felt hurt by his indifference, as we are engaged in the same cause. Lydia Maria Child previously edited the Standard. It was Child who served as editor and agent for Harriet Jacobs when she wrote Incidents in the Life of a Slave Girl. Hence, perhaps Johnson's interest in "H. Jacobs"--but really, he could have been more polite to Julia--she was a subscriber after all! The City Hall is an inferior building compared with the public buildings of Washington & the streets all seem so narrow in N.Y. after being familiar with the ‘magnificent distances’ of W.
Then took cars to Central Park, 3 miles off. What a lovely place! Trees, shrubs & flowers, carriage rides & walks, marble archways & bridges & steps of passages, lakes, swans & gondolas, deer, monkeys, parrots & eagles. 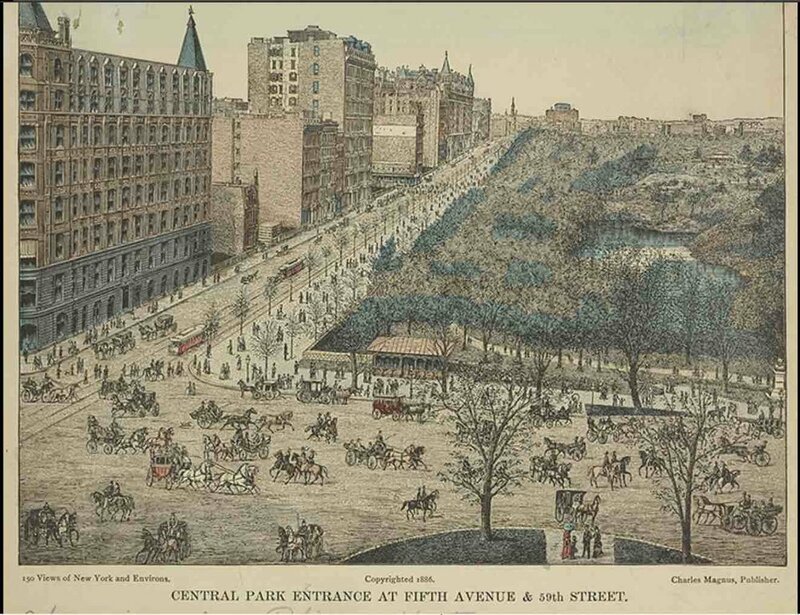 Pagoda, arbor, tent &c. Was there between 4 & 6 P.M. A stream of elegant carriages came in from 5th Av. Such fast horses, & splendidly dressed people, I never saw the like before. What immense wealth exists in this city! The "carriage parade" was apparently quite the thing, even though only 5% of the city's residents could afford a carriage, according to an account on the Ephemeral New York blog. This is the Park in the 1880s with "cars" and carriages. Note that the publisher, Charles Magnus, prepared the iconic "bird's eye view of Alexandria" 20 years earlier! Cars are set apart for Colored people. “Colored People allowed in these cars’’ is painted on some of them, but white people rode in them also. Went up 8th Av. & came back on 6th Av. —What an immense city! Returned time enough, waited ever so long for light in my room. So difficult to get attention, otherwise the House is pleasant. It is kept on European plan & is very near H.R. Depot [Hudson Rail Depot]. I intend to leave at 7 o’clock to morrow morning. She was a single woman traveling alone--no wonder she had a hard time getting attention. But noteworthy, too, that she spent a day and a night, alone, in the "immense city." Riot in N.Y. burning buildings, plundering killing &c—Drafting is made a pretext for this outbreak. First they destroyed the Pro. Mar. Office, then it was “down with the rich men” & houses were plundered & burnt. Negros beaten & killed, & cold. orphan asylum destroyed entirely. Remembering the wealth and the streetcar situation, Julia Wilbur was not shocked when she learned about the New York City Draft Riots the following week.